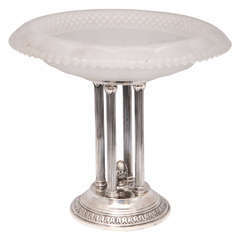 Important vintage silver centrepiece and tray, Italian manufacture Luigi Genazzi goldsmith - Milan. Fascist stamp 1034-1944. 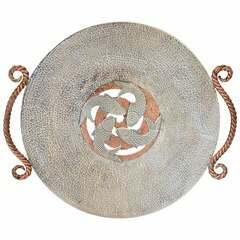 Rounded and inlaid body with two shaped handles with naturalistic attachment, lid grip and chiselled shaped feet with fruits. Very good conditions. Weight 3.515 Kg. This object is shipped from Italy. Under existing legislation, any object in Italy created over 70 years ago by an artist who has died requires a licence for export regardless of the work’s market price. The shipping may require additional handling days to require the licence according to the final destination of the artwork. Nicely decorated silver centerpiece. It is shell-shaped. This fun midcentury centrepiece incorporates a yellow textured glass platter which sits upon three brass arms that extend into candle sticks. Underneath is a wooden base.